Minister Noonan addressed the Finance Committee on the agenda for the upcoming Economic and Financial Affairs Council meeting. MINISTER FOR FINANCE Michael Noonan is still weighing up whether or not to seek a post-bailout line of credit. He was addressing the Finance Committee this morning ahead of his meeting on Friday with the Economic and Financial Affairs Council (ECOFIN). Responding to questions from Fianna Fáil’s Finance Spokesperson Michael McGrath on the precautionary credit line, to be used if Ireland needed more funds after our bailout exit, the Minister said that he didn’t see “any big downsides” to accepting it, although no decision has been made. “The big advantage is that Ireland gets out [of the bailout] in one way or another”, he said. Consultation with government, the NTMA, and the Central Bank is continuing, and previously the Minister said that the opinion was sought of other EU Finance Ministers. “The programme ends in December, and its is purely a technical measure to access funds available to us into February”. The Minister outlined the draft agenda of the ECOFIN meeting, which will consist of seeking “general agreement” on various aspects of the Single Resolution Mechanism and a Single Bank Resolution Fund, which he predicts will be “quite a debate” that will “continue late into the evening on Friday”. “Issues coming up would be the scope of it, and whether would it apply to the larger banks, would it apply to all banks”, Minister Noonan said. Our opinion would be that it should apply to all banks, as quite small banks have caused systemic problems in the past right across the Union, and caused a fear of contagion. Establishing the Single Resolution Mechanism and Single Bank Resolution Fund are both steps towards an Eurzone banking union, preparation for which will involve stress tests next Autumn. However, the Minister said that there is currently no indication that Irish banks will require recapitalisation, and if they do the funds will be sought either privately by the bank or by profit retention. He also said that the Single Bank Resolution Fund would not apply to credit unions. Commenting on the recent takeover of Newbridge Credit Union by Permanent TSB, he said that the policy objective of government and the Central Bank is that a credit union presence should be maintained in Newbridge, “if that’s by way of a strong credit union establishing a small office, or interested parties in Newbridge coming together to establish a new credit union”. 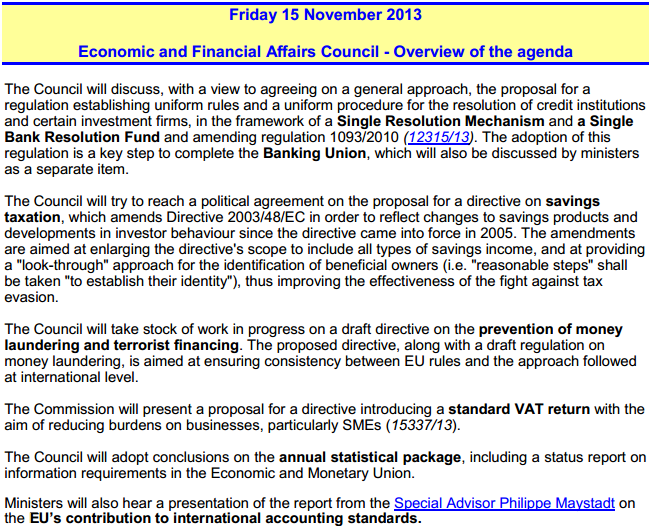 Issues surrounding savings taxation, VAT returns, and the EU’s contribution to international accounting standards will also be raised at the ECOFIN meeting. Read the full agenda here. It was stressed the discussion on VAT would be based purely on how returns are completed across the European Union, not on any adjustment of individual rates, and that it could result in a reduction of red tape and decreased costs for businesses. While Ireland’s bailout exit will not be brought up at the ECOFIN meeting, it will appear on the agenda in a Eurogroup meeting on Thursday. Minister Noonan said a standard section of the meeting will be discussion of the various bailout programmes. Email “"I'm reflecting" - Still no decision on post-bailout credit line says Noonan”. Feedback on “"I'm reflecting" - Still no decision on post-bailout credit line says Noonan”.